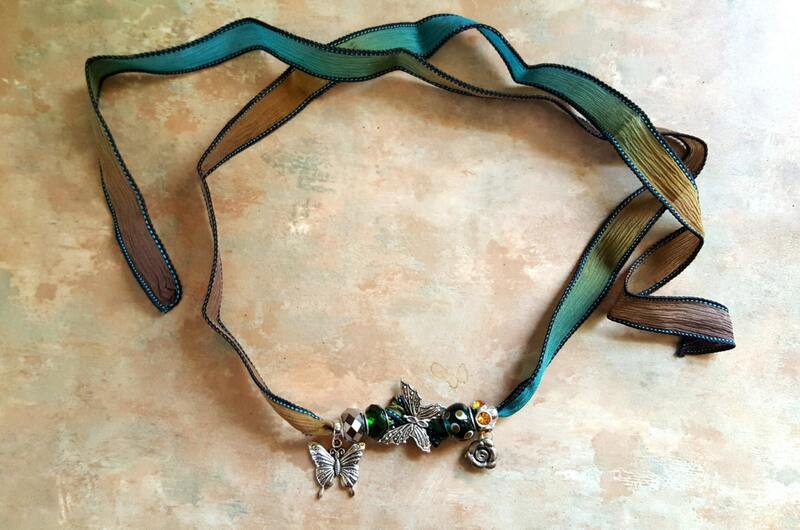 This lovely necklace/bracelet started with a beautiful blue/green/gold silk ribbon. I added lovely European style beads in varying shades of blue and some green and gold. The centerpiece is a lovely butterfly connector. It also has a butterfly charm and a flower charm attached to a loop slider bead. It can be worn as a bracelet, necklace or even an anklet! It is adjustable for length by tying it as long or short as you like, when you wear it as a necklace. As a bracelet or anklet, simply wrap it around your wrist or ankle and tie in the back.